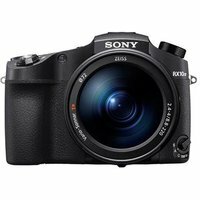 This is the 4th iteration of Sonys widely popular RX10 digital camera. Boasting an industry leading autofocus speed of just 0.03 seconds, a fixed Zeiss Vario-Sonnar T* 24-600mm lens, and 4K internal video recording, the RX10 IV packs a lot into camera with a 20.1MP 1.0-type sensor. 24fps continuous shooting and super slow-motion up to 1000fps are also in the RX10 IVs arsenal.